A warm welcome and touch of luxury awaits at Dairy Barns Bed & Breakfast set between the Norfolk Broads and the North Norfolk coastline on a working family farm with 6 cosy Bed & Breakfast rooms and 3 Extra-Special rooms. You’ll receive a personal and friendly welcome with tea and homemade cake on arrival. There’s a relaxed atmosphere, a touch of luxury and plenty of flexibility. Additionally, three self-catering cottages are also available. Open all year round, one is yards from the Farm in the heart of the countryside and the other two a short walk from Sea Palling beach for seaside holidays. We have 6 regular rooms, each beautifully colour-themed and all on the ground floor that look out over the courtyard garden or farmyard. Although we may call them our regular rooms, we still believe in pampering all our guests and these rooms are of course very comfortable, spacious, well-equipped and come with what we consider to be those important little finishing touches such as luxury Body Shop toiletries, delicious chocolates on your pillow, a variety of magazines, fresh flowers and of course television/DVD and hot drinks tray. Our regular rooms are all en-suite with fantastic power showers and luxury towels and have wonderfully comfy twin or super king size beds with crisp linen and cosy, pretty duvets. Our bed & breakfast accommodation is flexible to suit larger groups and we also have adjoining doors to form a family suite in two of the rooms. Most of our regular rooms can also accommodate up to 2 children in put-me-up beds. We can accommodate guests with limited mobility or wheelchair users with one of our rooms offering wider doorways and a large wet room style bathroom with shower seat. It is also located closer to the Breakfast Barn than other rooms. Please contact us to discuss specific needs. Our Extra Special Rooms are completely self-contained with a lounge area with TV/DVD, comfy sofa and dining table, luxury bathroom with fluffy towels, robes and luxury Body Shop toiletries provided. They have super king size bed and each has doors leading onto their own private courtyard garden. All have a kettle so you can make a cup of tea or hot chocolate and of course a fridge and glasses in case you want to enjoy a glass of wine or champagne. Each Extra Special Room has their own front door for complete privacy and they are very special places to stay. We have a snug coastal-themed guest lounge which is a comfortable place to relax in the evening or on a rainy day with a selection of good books, board games, wine glasses and a corkscrew and for your enjoyment an enclosed garden with large courtyard is available for our guests with a number of garden games for all the family. Norfolk is a renowned for its home-grown food and we use only the very best fresh, local ingredients for our breakfast menu for our Farmhouse Breakfast from trusted local suppliers. We offer an extensive choice from our traditional Full English Farmhouse Breakfast with rare breed pork sausages and bacon to delicious homemade waffles. We also offer fresh fruit, cereals, toast with local jams and marmalades. Enjoy the beautiful setting in 360 acres of farmland, nestled between the Broads and the coast, with farm walks and advice about where best to spot the abundant bird life and even red deer. Guests are also welcome to say hello to Molly, Frankie, Podkin, Holly and Ted – our horses and ponies as well as dogs Shadow and Berry and Poppy the cat. We can offer recommendations of places we know and love ourselves – where to eat, places to visit, the best beaches and pubs and practical help with venue or restaurant bookings or picnic baskets if required. 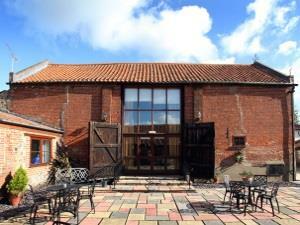 Dairy Barns is an excellent base to explore Norfolk and is well located for great local activities including walking, cycling and bird watching as well as heading further afield to take in Norfolk’s coastline, rural landscape, market towns and villages, historic houses, wildlife, city life and so much to see and do for all the family. There is Wireless Internet connectivity throughout, although due to our rural location speeds can be slow! Plenty of free private undercover parking available. TRIPADVISOR, Enjoy England Awards for Excellence 2010 – Regional Winner. Norfolk Tourism Awards Best Bed & Breakfast 2011. EDP Business Awards 2014 – Finalist – Best Customer Care. From Norwich/Wroxham. Take the A1151 to Wroxham from Norwich. Travel through Wroxham. At Stalham take the 2nd left at Tesco's jct, signposted Sea Palling and brown sign for Waxham Barn. Go across mini-roundabouts following signs for Sea Palling and Waxham Barns. Half a mile before Sea Palling take right turn, Hickling Lane. Dairy Barns are 1/2 mile on right hand side.